Lightning-fast performance and titanic storage up to 12 TB give your desktop or creative professional system the edge you need to be your very best. BarraCudaÂ® Pro 3.5-inch drives are also backed by a 5-year limited warranty. 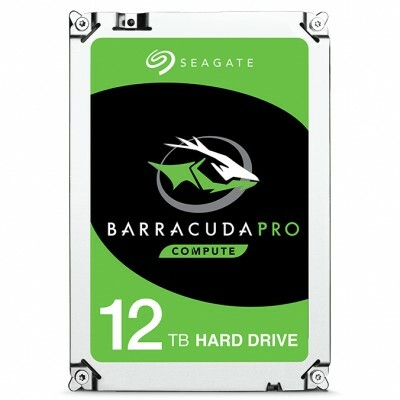 Introducing the 12TB BarraCuda Pro 3.5-Inch Hard Drive! The BarraCuda Pro is a creative professionalâ€™s and tech enthusiastâ€™s dream. Equipped with 7,200 RPM makes the BarraCuda Pro the fastest 12 TB desktop drive available. Large cache size pushes your PC to new performance heights so you can load applications and files even faster. Plus the BarraCuda Pro is backed by a best-in-class, 5-year limited warranty for your peace of mind. Coupled with IntelÂ® Optaneâ„¢ memory, a revolutionary class of non-volatile memory, BarraCuda hard drives deliver it all.